We take pride in selling Vintage leather club chairs in the best possible condition with original leather, partially or fully restored. With the proper care your chairs will last for years to come. In order to preserve these beautiful Vintage leather chairs, we highly recommend that you don’t sit on the arms and check your pockets before sitting ie: tools, keychains etc. Treat them as if they are in your own home and help others to understand it’s a group effort to respect these beauties. 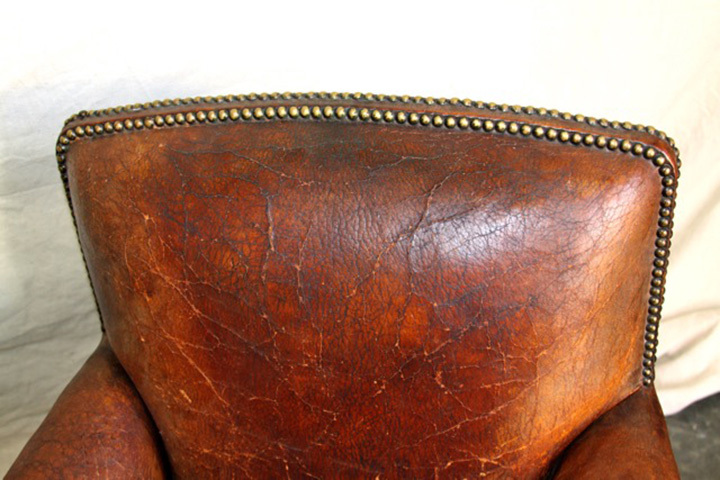 Conditioning: We recommend using a leather conditioner twice yearly (more often if your chairs are in direct sunlight). The brand Cadillac makes a wonderful conditioner that we use on our own chairs. You can find it at most auto supply or hardware stores, or check their website: cadillacshoe.com. We believe that the best technique for applying it is to pour a small amount on to a glass plate, dip your flat palm in it and rub the chair in broad, overlapping circles. If you drip on the chair and it makes a darker ring, simply apply a little extra there and feather the edges of the circle with gentle circular rubbing. We find the best method is to use your hands directly - if you use a towel or rag , it just ends up soaking up most of the product. Cadillac is non-toxic and non-sensitizing to the skin and actually makes your hands very soft. The scent is neutral and it cleans off your hands with soap and water. Waterstains: If you get water or fluid marks on the chairs, immediate treatment is key. The same “feathering” method should be used to lessen the potential stain. Slightly dampen a clean rag with water and gently rub the stain in a circular motion to feather the edges so there will not be a definite edge. Scratches: Minor scratches to the chairs that are visible can be lessened using a touch of Kiwi Brown shoe polish melted between your fingers and rubbing broadly over the scratched area. Do not concentrate just on the scratched area, diffuse the wax over a larger area so that it blends in. Any other questions or if you need major repairs, please contact us.